All teams attempting K2 this year are in base camp now, few climbers who are going to attempt K2 after Broad Peak will join them later. I already explained in last blog that Swiss team and Himex are going on Cessen route, Hungarian/Spanish team acclimatizing on Abruzzi spur. Madison Mountaineering and Seven Summits teams are also in the base camp now. I asked Vanessa O’Brien (American climber, she is climbing with Madison Mountaineering) about the route Madison team is going to attack. I was told by Vanessa that they are going to attempt Abruzzi spur (normal route on K2). She further added that ropes have been fixed up to camp 2 and sherpas working to fix ropes to camp 3. Seven Summits team also climbing on Abruzzi Spur; we now have three large teams on Abruzzi Spur: Madison Mountaineering, Seven Summits and Hungarian/Spanish expeditions. The problem of Bottleneck is still unsolved, Cessen route and Abruzzi spur meet on shoulder and route from there on is same, there will be huge traffic under bottleneck if there is only one weather window this year. A weather window is expected on July 20-26 according to Nicholas Rice and teams are trying to complete rotations before the window arrives. 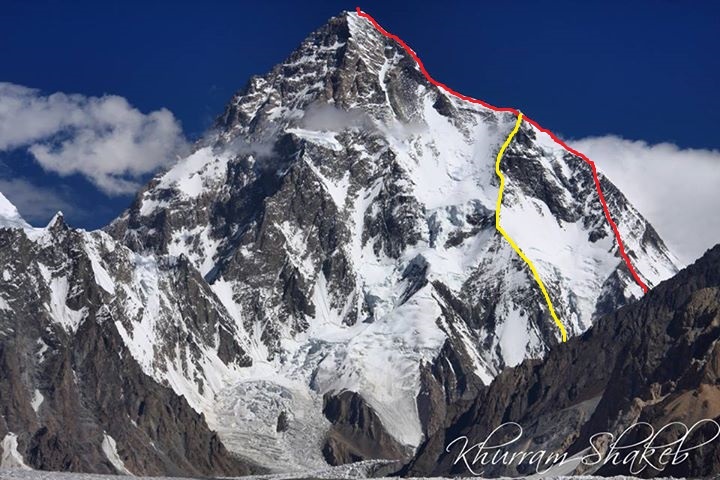 The red line in picture is abruzzi which is normal route to climb K2, Yellow line is Cessen route which meets Abruzzi spur on shoulder. Red line Abruzzi Spur and Yellow line is Cessen route. Swiss team set deposit at 7100 meter, and now they are back in the base camp. Their plan is to make another rotation and try to spend a night at 7500m, before they launch summit push. Himex team is getting ready for third rotation; they will try to reach camp 3 in next rotation. Spanish/Hungarian expeditions are also getting ready for second rotation and camp 2, there is prediction of bad weather for 2/3 days so teams are staying put for now. For live updates on mountaineering: @NorthmenPk on Twitter and https://www.facebook.com/TheNorthmenPakistan on fb.